At the age of 2 my daughter would insist I play ‘Evita’ every time we got in the car. Her favourite DVD was Joseph and his Technicolour Dreamcoat and she is often heard singing ‘Close Every Door to Me’ in a fake vibrato. A recent favourite is ‘Pirates of Penzance’. At the weekend she waltzed downstairs in a party dress,singing in a falsetto voice and declared ‘I’m Mabel’. The girls love of musicals is such that I knew they would enjoy ‘Shrek the Musical’. I’m a fan of musical theatre too but I wasn’t sure I would enjoy it. As a classic animation I wondered if it would really translate to the stage, why turn it into a musical? Isn’t everything being made into a musical these days? I was however, pleasantly surprised. It took a while to get into the songs, at first I felt it was a nice alternative to watching a pantomime, but as it went on I became more and more absorbed. Just as in the animation there are some great characters and the original Broadway cast are spectacular. I particularly loved Pinocchio, the cross dressing Wolf and Donkey who was even more camp, flamboyant and hilarious on stage than in the animation. The girls were fascinated by Lord Farquaad’s costume. They spotted immediately that the legs weren’t real (they thought his tiny feet in the bath were hilarious) but couldn’t work out how they made him so small. The show received a Tony Award in 2009 for best costume design of a musical and I can clearly see why. I loved the tap dancing rats at the start of Act 2 and the girls were up and dancing along. It is so expensive to take a family of 5 to a live show these days, so it is refreshing to be able to watch one from the comfort of our sofa. I thought it was a great family show, I’m not singing any of the songs after the first viewing but I’m sure it won’t be long. There is a sing-along section on the DVD once we become really familiar with the music. Musicals aren’t everyone’s cup of tea but this one was funny, visually stunning and highly entertaining. There is something for everyone (with a large dose of cleavage for the dad’s). I’ll definitely see it live if it ever comes to town. The UK tour begins in 2014. At about 2 hours long it is a little long for very young children (my 3-year-old struggled to sit through it) but my 5-year-old was mesmerised. The DVD is a sensible alternative to taking very young children to an expensive live show. 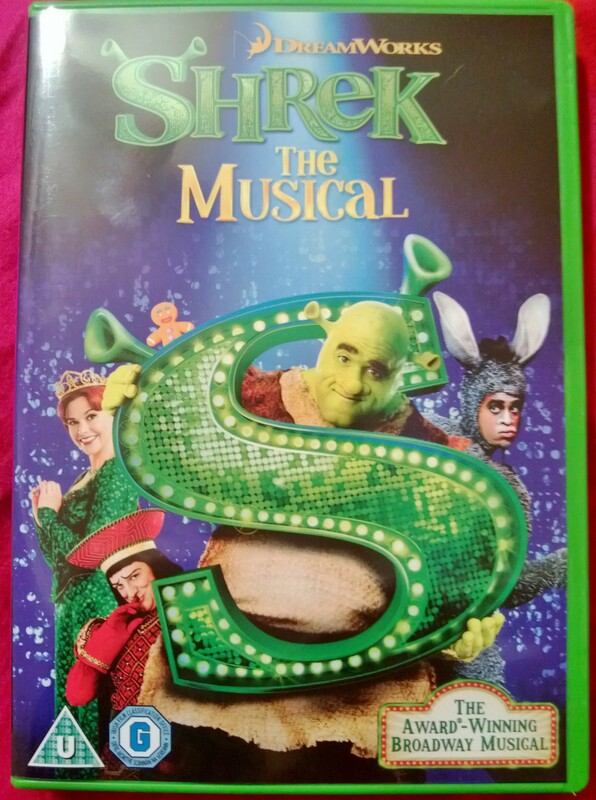 Shrek the Musical is available In the UK from 2nd December 2013 in DVD, Blu-ray and Digital HD. Disclosure: No payment was received for writing this post. A copy of the DVD was received for review purposes.